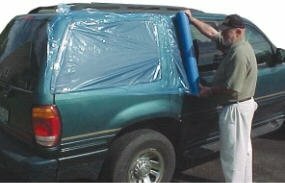 Wreck Wrap 3 mil vehicle protector film. 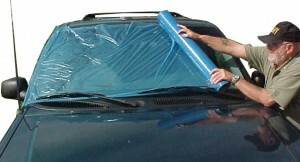 Wreck Wrap is a self adhesive back plastic weather barrier film. It seals out rain, dirt and snow from vehicles which have been involved in collisions and have broken windows or sprung doors. Our adhesive back plastic is UV resistant and yet easily removed from the vehicle body without damage to paint, nor does it leave a residue. 3 mil self adhesive back plastic made of blue polyethylene weather barrier. Standard wound, sticky side in. Each roll is 3 mil x 36" x 100' - 1 roll per case.